Christians celebrate November 1 as the Feast of All Saints. But I like to dedicate today to St. Roch, the patron saint of dogs. St. Roch is also the patron saint of invalids, bachelors, surgeons, tile makers, and cattle disease. According to legend, St. Roch was born in Montpellier, France 1295 to a wealthy family, but he gave away all his earthly possessions at age 20 when both his parents died. He then traveled to Rome where he began attending to the sick. Soon he became known for miraculously curing people by making the sign of the cross on them. 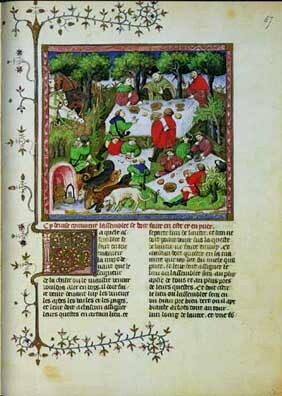 When he became ill, he was expelled from the city and made a hut of leaves and branches in the forest (I suspect this is where his patron of bachelors status came from). There, a dog belonging to a nobleman brought him bread and licked his wounds, eventually healing them. One day, the nobleman followed his bread-carrying dog, discovered Saint Roch, and became his acolyte. St. Roch ultimately died in prison in 1327 (his unscrupulous uncle put him there and Roch refused to give his true identity to avoid worldly glory) before the Black Plague ravaged Europe from 1347 - 1349. But his story survived and a rich iconography developed around him during those terrifying times. Here are some works depicting St. Roch. Not all include dogs, but I thought they were interesting. P.S. St. Roch in Italian is St. Rocco, which sounds cooler to me. 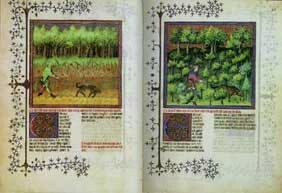 Fifty pages of Gaston Phoebus's "Le Livre de la Chasse" are on display at the Morgan Library and Museum in NYC right now in an exhibition entitle "Illuminating the Hunt." 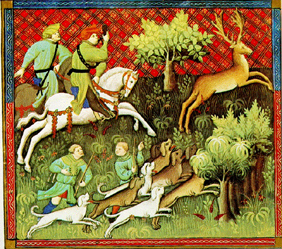 The 14th century illuminated manuscript is considered an authoritative text on wild animals, hunting methods, making love and war, and caring for hounds. 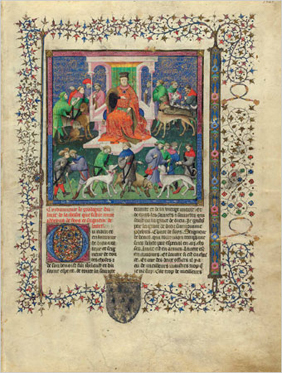 The Morgan's copy of this lavishly illuminated (artist unknown) guide for aristocratic sportsmen is considered one of the two finest surviving examples (the other is at the Bibliothèque Nationale de France). The rare book needed to be disbound for conservation so this is a wonderful opportunity to view the pages as the individual works of art they are. According to Karen Rosenberg of The New York Times, Phoebus's work can be challenging for animal lovers, with sections devoted to strategies for tracking, trapping, and flaying quarry. 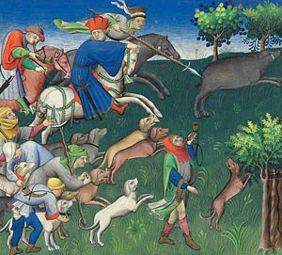 But the violence of the hunt is offset by Phoebus's devotion and respect for dogs. 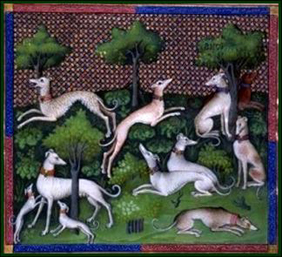 The author kept 1,600 hounds, promoted foot baths, haircuts, and ear exams for them, and calls them "the noblest and most reasonable beast." Today, I consider hunting barbaric. But dressed in jeweled tones and written for 14th century aristocrats, "Le Livre de la Chasse" sounds like a gem I would love to see for myself. I love the dogs begging at the table with their sweet, eager faces. Some things never change for dog owners! The exhibition runs until August 10, 2008. More information here.